Freshman catcher Priscilla Martinez makes contact in the Colonials 1–0 loss to Dayton on Saturday. She had one of GW's five hits during the game. 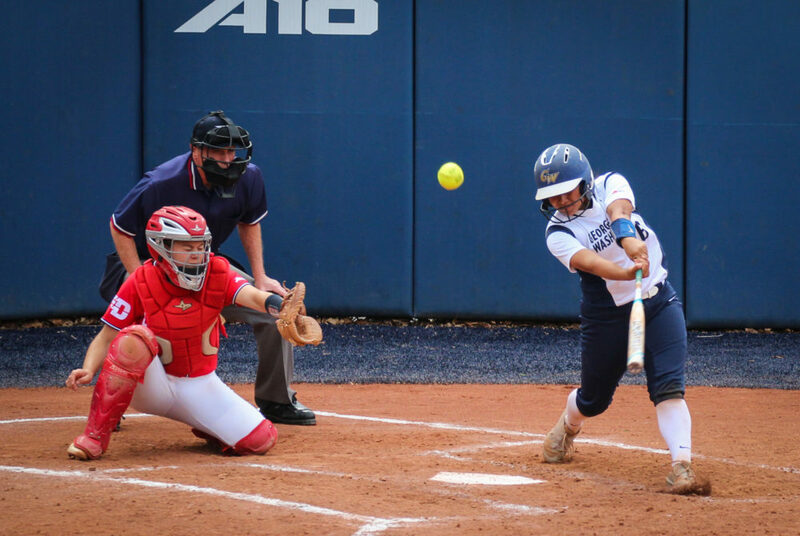 Updated: March 27 5:45 p.m.
On the tail of a three-game win streak, softball suffered a sweep in its opening Atlantic 10 series against Dayton this weekend. The Colonials (13-14, 0-3 A-10) had a rough start to the series on Saturday, falling to the Flyers (15-13, 3-0 A-10) at home in both ends of a doubleheader. Although GW’s bats were firing Sunday, more than doubling its combined run-total from the day before, it was too little, too late after early pitching struggles. The opening contest proved to be a test of defensive prowess, with both the Flyers and Colonials limiting offense with solid pitching and fielding. Junior Sarah Costlow (6-5) was in the circle all seven innings, holding Dayton to five hits and one run. Freshman right fielder Jessica Linquist praised the Colonials’ fight, despite the team’s lack of immediate results. Both teams were held scoreless through four innings, despite early hitting efforts by the Colonials. Freshman catcher Jenna Cone doubled in the bottom of the first, but a single by freshman designated hitter Priscilla Martinez was not enough to bat in a go-ahead run. In the top of the fifth, the Flyers scored what would become the game-winning run, scoring on a double and a single for one RBI. The Colonials were unable to overcome the strong defensive play by the Flyers in the late frames of the game. Despite a single by junior second baseman Rochelle Draper in the seventh, the Colonials dropped the decision, 1–0. Game two of the doubleheader went no better for the Colonials, with Dayton finding its rhythm early. Difficulties establishing footing in the circle doomed the Colonials, DeFeo said. Starting pitcher sophomore Jayme Cone (1-2) lasted only one inning in the circle, with freshman Kaitlin Buff coming in relief early in the second after Cone let up three hits in the first frame. The top of the second was explosive for the Flyers. They scored five runs against a floundering Colonials defense and capitalized on a center field error. The Flyers jumped on Buff in the fourth inning, scoring on a walk and a double. Junior Ashley Pilcher came in relief, but the Colonials were still deep in a 9-0 hole. The Colonials responded in the bottom of the fourth with a double by junior center fielder Morgan Rinehart. After junior left fielder Alana Anderson reached on a fielder’s choice, the Colonials got on the board with an RBI single by senior shortstop Megan Linn. Linquist batted in another runner on a single, tightening the score to 9-2. Dayton capitalized on two fielding errors and took an insurmountable 12-2 lead in the top of the sixth. The Colonials were unable to answer in the bottom of the sixth, triggering the eight-run mercy rule and the loss. The three-game series ended with a hard-fought game in which the Colonials fell short in a close 7–5 loss. Starting in the circle was Costlow. She pitched two innings, but was relieved by freshman Faith Webber after the Flyers had scored four unanswered runs early on in the matchup. The third and fourth innings proved to be the turning point in the game because the Colonials were able to score five runs to trail 6-5. One of those five came on a solo homer by Cone, her 12th of the season, to break the program’s single-season home run record. The Colonials kept the Flyers scoreless throughout the fifth and sixth innings with strong pitching and solid defensive play. In both frames, the Colonials faced three batters and recorded three outs. Pilcher rounded out the pitching for the Colonials in the top of the seventh inning after the Flyers put another run on the board, putting them up by two. GW did not respond with its final chance, as Dayton picked up three quick outs and closed out the sweep. The Colonials will return to action Saturday at 1 p.m. at Massachusetts. The Hatchet incorrectly reported that Sarah Costlow had a record of 6-4 instead of 6-5 and that it is a 10-run mercy rule.